It's the perfect companion for your humidifier and dehumidifier. You can use humidifier or dehumidifier to change the humidity of ambient environment according to the reading from our Thermo-hygrometer. -- Comfort: Humidity: 30%-60%, temperature: 20°C-26°C (68°F-79°F). The humidity temperature gauge displays all-time highest and lowest records for both humidity and temperature. Switch display"" All Times&24HRs"":Max/Min temperature and humidity memory. Press the CLEAR button for 3 seconds to remove Max/Min records. You touch it, the night light is on for 15 seconds,then it is turned off immediately. Press the button on the back to switch between °C and °F. Temperature&Humidity Range:Temperature accuracy: 0.1°C ,Temperature range: -10°C-50°C (14°F-122°F),Humidity accuracy:1%RH, Humidity range: 10% to 99% RH. Max&Min Records:Digital thermometer hygrometer displays maximum and minimum temperature & humidity records. Temperature&Humidity Status:Humidity level icon indicates air condition: DRY/COMFORT/WET. 3 Options of Mounting :Features a table-top stand and magnet back and hang hole for mounting options, powered by two(2) AAA battery (NOT Included). 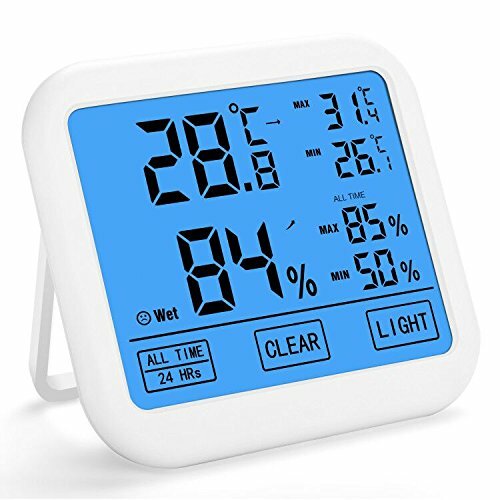 Multi-Functional:Digital thermometer hygrometer monitor temperature and humidity, with Max/Min records(All time&24 HRs switch button),Clear button,Light(Let you get your surrounding environment clearly whenever day or night ). If you have any questions about this product by Amoboo, contact us by completing and submitting the form below. If you are looking for a specif part number, please include it with your message.